EPR-forum goal is Bridging Information Systems in Real Time ! Senior systems- and development engineer with 25 years of experience from telecom and satellite communication infrastructure for maritime, land, and airborne communication via the Inmarsat satellite network. Public change of thinking with the goal: "eGov as a common superstructure Platform" ! 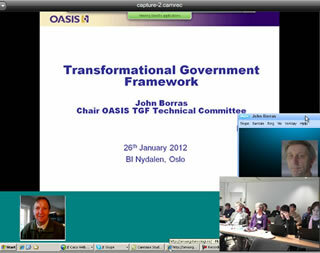 EPR-forum in co-operation with OASIS , The Norwegian Computer Society and BI. The Norwegian Computer Society topic group "Health and ICT" has got two international specialist speakers to talk about the eGov 2.0 paradigm. The change of thinking: The Citizens have to be active stakeholders/owners of our common Society and not passive Clients ! The new internationally Interaction and Interoperability paradigm in Public Service Management going on these days is named eGov 2.0. This handle the interaction between Service Receiver and his/her social network, The Public service system, Private service executers and Charity and Voluntary service organizations. Engineering manager and Project manager, with 20+ years experiences across Europe, USA and Asia in video TelePresence, Collaboration video technology devices and electronic/mechanical hardware products. Extensive 10+ years of multi-discipline managerial experiences to conceptualize, develop and deliver technology products. Proven record technical experiences within TelePresence with international industry, customers, suppliers and manufacturers particularly in China, India, Poland, Taiwan, Scandinavia, USA and United Kingdom. Enjoys to work in fast-paced, high pressure environments with a proactive mind-set and with solution oriented approach. Proven analytical skills, creative and flexible both as technical leader and project manager. EPR-forum is glad to have Harald as an advisor and part of our eHealth competence group dealing with new disruptive digital solutions for Hospitals and Institutions, but also in the Home care market. David Webber, chair advisory board international for EPR-forum. David is now a Global Public Safety Expert at Huawei Enterprise Business Group after being working as Information Architect at Oracle Corporation and US Government Contractor.